Welcome on the Galway Polish Saturday School page. We are the biggest Polish Society in Galway. Our school counts 400 students. We teach all grades from preschool to secondary school. The school was established in 2009 and now is one of the biggest Polish ethnic schools in Ireland. Children come to school every Saturday morning for only 4 hours. For us- teachers - it' s a little, but for youth it's a great effort. The students represent different levels of knowledge of the Polish language. There are some who never hear the language spoken at home, and there are those, who communicate with their parents only in Polish. Our main goals are to teach the language and culture of Poland also to learn about and to respect other cultures, languages, races, and religions. The students of Polish School in Galway should be able to expect a welcoming learning environment, free from prejudice and racism and to relieve the linguistic, social, and cultural disorientation faced by many students. In 2014 we enrolled over 100 new pupils. Five years ago, on Saturday 12th of September at 10:00 in the morning, the first bell rang in The Polish school in Galway! This was a big event, mostly becau﻿﻿se, the struggle to create this school for Polish kids went on for two years. Mrs. Agnieszka Grochola, the creator of the idea of organizing the Polish School in Galway, together with our teachers and also with Galway Irish Polish Association – in May and June 2009 – led a 2 months project in the school in Claddagh. Then, in September we moved to a bigger building with our Polish School in Galway Association, where we are non-stop for the past five years. Since 2009, every Saturday, in the Holy Trinity National School buildings 350 pupils aged from 3 to 17 meet together to learn their native language and their own country's history. It is a non-profit organization, whose aim is to teach the Polish language and to care for the Polish national traditions. We organize some events each year. The after school activities include: scouts, art and dance classes. The school held a lot of one-off events such as; the only instance in Ireland of the Gulliver Theatre from Warsaw for our school at the Town Theatre in Galway ( September 2011 ). The school was also filmed for a documentary about the work of the Polish School in Galway by a student of the Galway - Mayo Institute of Technology- (GMIT) Michael Ryan which has filmed it for his diploma work. In January - April 2011. In 2012, the school had organized the first competition for schools all around Ireland called TUDOMTAMDOM.COM. We took part in the St. Patrick parade in Galway,on the 17th of March 2011, 2012 and 2013. The school maintains a similar number of students year after year, it is also a place for integrating the local Polish community. We also have the world's largest Polish school library with over 6 000 volumes and a digital catalog. We regularly take part in competitions for Polish Schools and get rewards and achievements. Our teachers, just like us, still raise their qualifications by taking part in training and conference. The schools principal - Mrs. Agnieszka Grochola as the representative of Ireland's largest Polish school in the years 2010-12 was an expert with the Ministry of National Education. She also co-organized the umbrella organization for Polish School in Ireland http://www.polskamacierz.com/english.html and the Congress of Polonia Education. Today we are sharing not only our happiness, but also a part of our lives, which nearly 5 years ago gave us a chance to come closer to our parent's and grandparents' Country. Your presence here today in such an important moment for us, which is not only a celebration of our 5 year anniversary, but also the giving of our patrons name Wisława Szymborska, is an honor for us. On behalf of our students we would thank you for those years of hard work, which only but reminds us that to be Polish is a pride. Poland is a country of eight Nobel Prize winners, winners of many awards and such outstanding people as John Paul II and Lech Walesa. Once again, thank you for creating such a place, which is the Polish School in Galway. 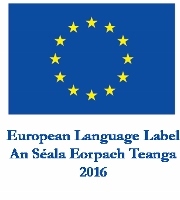 The winners of the European Language Label 2016 received their awards at a special ceremony in Farmleigh, Phoenix Park, Dublin on 30 September. Our school was one of them! The European Language Label (ELL) is an award encouraging new initiatives in the field of teaching and learning languages, the rewarding of new techniques in language teaching, and spreading the knowledge of languages' existence, thereby promoting good practice. On the 5th of October Polish School in Galway celebrated the 5th anniversary and school received a name of Wislawa S﻿zymborska, popular polish poet and winner of the Nobel ﻿Prize in Literature in 2006. It was a very special day for Polish Community in Galway. There were many guests from Poland and not only. On that day, Polish School hosted Polish Ambassador - Marcin Nawrot, Galway Mayor Councillor - Pádraig Conneely, and guest of honour Mrs. Danuta Wałęsa (former First Lady in Poland - in Office 1990-95). She is the wife of the former President of Poland, also known as a freedom fighter - Lech Wałęsa. In 1983 she represented her husband in Oslo when he was awarded Nobel Peace Prize. The School's event also had in attendance Michał Rusinek,﻿ personal secretary of Wisława Szymborska, Maciej Jakubowski, deputy Minister of Polish Ministry of National Education, Terry O’Flaherty, former Mayor of Galway and many more. The day included guests' speeches, children's performances, symbolic ribbon cutting and birthday cake. It was a a very special day and we would like to extend a big thanks to everyone who helped in its organisation and those who attended on the day. We would also like to extend a big thank you to our students, their parents, teachers, sponsors and friends of the school!